Perhaps some of you would call me old-school, and that's just fine with me. 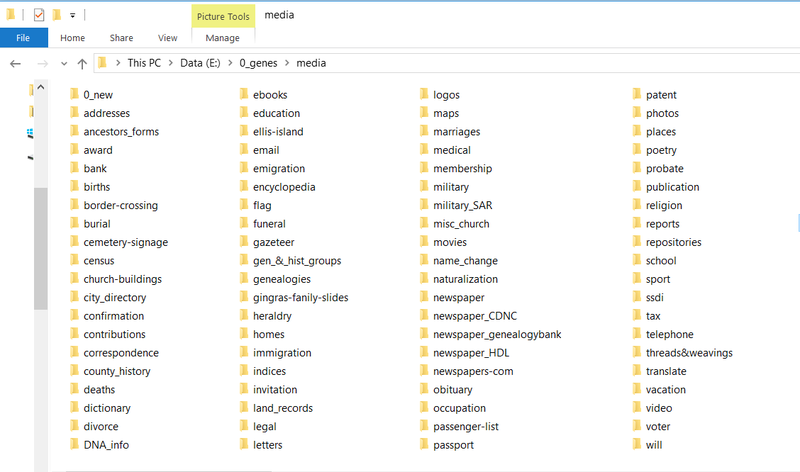 I use my subscriptions to Ancestry.com and Newspapers.com and GenealogyBank.com as essential Repositories of data and images. I do NOT have an online tree with Ancestry nor FamilySearch, so I never see any Web Hints. I'm quite accustomed to doing my own searches. I rename every image and PDF during the download process, and place the new file into my appropriate subfolder. Often, I open those media files in Photoshop and/or Paint for additional edits. Then I go back to RM and tag those files to a Master Source, Citation, Place, Person and/or Fact. During that step I assign a Caption and Description to each media file. File > Properties currently shows 25.7K multimedia files and 160.3K multimedia links. So, each media file has approx. 6-1/4 links. I can update the Caption and Description from any one of those links, and it takes effect for every related link. That's very helpful when I detect misspellings or other errors of omission. Here's the current top-level organization of my media files. Note that a bunch of these top-level folders include subfolders. For example, there is a separate Census subfolder for each census year from 1681 to 1956.